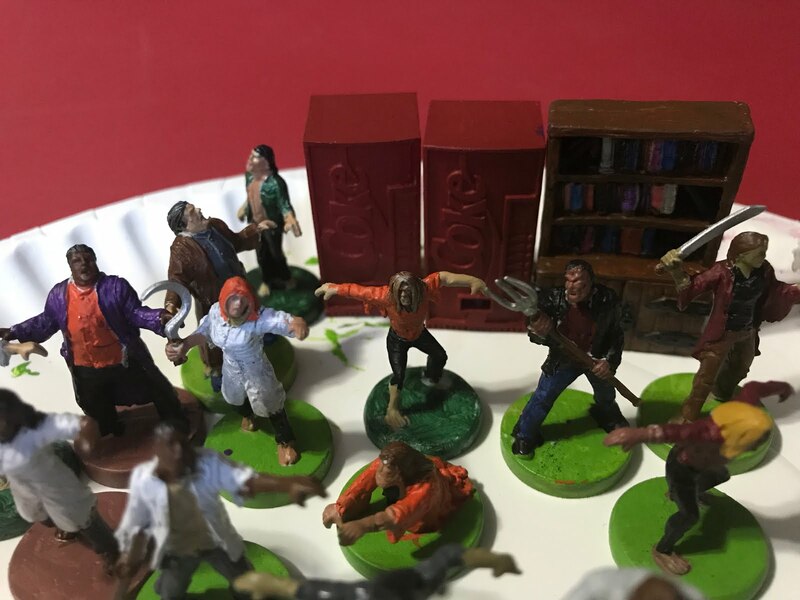 These are zombie miniatures for Last Night on Earth. I managed to finish 12, probably another two dozen to go. Sean came over to paint with me, and made a lot of progress on his Blood Bowl team. We also watched seven episodes of Knight Rider in glorious high definition. Not a bad way to spend a Saturday afternoon. You can try masking fluid ("Liquid Frisket", the ultimate CHAOS agent!). It's goo that you paint on and then when it dries peel away or cut with an X-Acto knife the mask from the areas you want painted. Then paint willy-nilly and when the paint is dry, peel off all of the frisket. What remains will be painted logo. If you've used Masks in Photoshop, same thing. It will let you paint with ultimate detail over large areas. Or you could simply use a small roller, since the logo is all raised. Or use a brush with very short hairs and just lightly dry-brush the raised parts with multiple passes until you get the desired effect.